Word came last night that Kyrie Irving will be available for Duke, but how big a difference can he make for a team already at a one-seed? According to a study conducted by BracketScience.com, Michigan head coach John Beilein is the second-best coach at outperforming his seed. Missouri is ninth in the nation in scoring, but it’s mostly due to Mike Anderson‘s uptempo style rather than smooth shooting. A survivor mentality is crucial for Memphis, who fell under the radar during a roller coaster season. Bucknell senior GW Boon, a Kansas fan when the Bison shocked the Jayhawks in 2005, changed allegiances when the coaching staff came knocking shortly after. It’s taken a few years, but Mick Cronin finally has Cincinnati on the upswing. Old Dominion is one of this season’s Cinderella candidates, behind big man Frank Hassell. A veteran lineup is expected to get plenty of mileage for the Notre Dame Fighting Irish. Off the court, Utah State is one of just seven schools in the NCAA Tournament with perfect graduation rates. Richmond coach Chris Mooney has been poring over Vanderbilt film and has a good idea of what the Commodores will try to do Thursday. If someone would have told you in November that the preseason second- and third-ranked teams would be unranked on February 1st, you wouldn’t have believed it, right? Well, as we change our calendars to the new month, that’s the position in which we currently find ourselves, as Michigan State and Kansas State have each so far experienced what could be accurately referred to as a lost season — that anomaly of a 1-3 year stretch that befalls even the best and biggest programs, resulting from circumstances almost nobody could have forseen. Michigan State was a Final Four participant last April and entered this season with almost every publication selecting them to run away with the Big Ten. At the time, it was difficult to come up with reasons why this wouldn’t come to pass. Tom Izzo’s squad included a healthy Kalin Lucas, the versatile Draymond Green, experienced swingman Durrell Summers, formidable big man Delvon Roe, and last year’s NCAA Tournament hero for MSU, Korie Lucious. Shortly after the season began, however, it became clear that this version of the Spartans would be different than the team tabbed as one of the nation’s best. Almost all of the action is on Saturday but what a day it will be. A couple of huge games start us off right away at noon but the rest of the day will not disappoint. 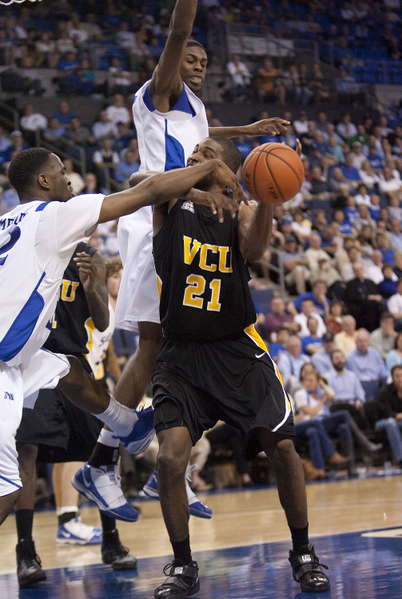 It’s very unfortunate but #21 St. Mary’s @ #23 Vanderbilt is not on television and neither is Belmont at East Tennessee State on Sunday, a battle for first in the Atlantic Sun. You obviously won’t be able to watch those games unless you’re attending but definitely check and see how they play out. All rankings from RTC and all times eastern. It should be a crazy environment in Champaign on Saturday when the #1 team in the land pays a visit. Illinois is having a good year but probably not as good as some of the more optimistic Illini fans would have hoped. That can change in a big way with a marquee win over the Buckeyes. You’ll recall what happened almost six years ago in Columbus. Illinois was #1 at 29-0 on the last day of the regular season and lost on a Matt Sylvester three with five seconds to play as the unranked Buckeyes knocked off the eventual national runner up. By the way: Gus Johnson was working that one in 2005 and he’ll be in Champaign on Saturday if you even needed another reason to tune in. A few teams face key road tests tonight, one night after the home squads went 3-1 in the season debut of ESPN’s Big Monday. All rankings from RTC and all times eastern. The Spartans needed overtime to dispatch their last two opponents at home, Wisconsin and Northwestern. 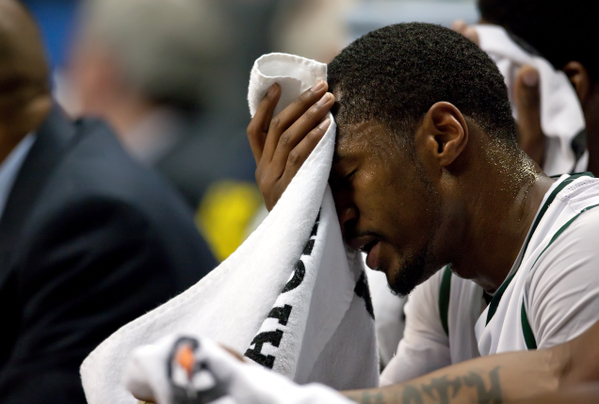 Michigan State is doing just enough to get by as Korie Lucious and Durrell Summers have struggled lately. Lucious went 0-8 from the floor against Northwestern while Summers has scored just seven points in the last two games. For MSU to have any sustained success going forward, Tom Izzo must get these two players going somehow. Luckily for them, Draymond Green has stepped up, averaging 21/8.5 over the last two games. Two ranked teams take to the road this evening against a couple of clubs trying to crack the top half of their respective conferences. All rankings from RTC and all times eastern. 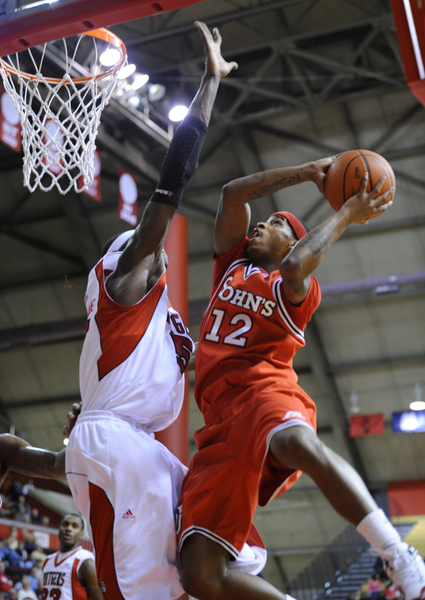 Can Hardy And the SJU Boys Maintain Recent Gains Tonight Against the Hoyas? Steve Lavin makes his Big East home debut tonight at Madison Square Garden as St. John’s looks to score a big win and move to 3-0 in conference play, already off to their best start since the 1999-2000 team began 4-0 in the Big East under Mike Jarvis. The Red Storm have looked like a different team over the last four games. Since an embarrassing loss at Fordham on December 11, St. John’s has won four straight over better competition. The offense started to click in the second half against Northwestern and they haven’t looked back at all. Lavin’s offense is on fire due to the inside play of Justin Burrell and Justin Brownlee, the former shooting 76% over his last three games, as well as Dwight Hardy on the perimeter. The 6’2 senior guard has scored 41 points over the last two games and is shooting 40% from three over the last three. Even with the improved shooting, Hardy is still under 30% on the year from deep giving you an indication of how much he was struggling before this hot stretch. St. John’s gets a lot of points inside (59% of their total production) and has only attempted 17 threes over the last two contests. They shoot 53.5% inside the arc and utilize their forwards and dribble penetration effectively. In case you hadn’t noticed, Michigan State’s 52-game non-conference homecourt winning streak ended with an icy thud tonight as a young, athletic Texas team went into the Breslin Center and dominated Tom Izzo’s team, 67-55. Before we get to the “problems” that the Spartans have, let’s consider a little bit of historical context with this program before we pull the alarm bells at the firehouse. Since the last time MSU entered the NCAAs as a #1 seed in the 2001-02 season, Izzo’s teams have been to nine NCAA Tournaments with an average seed of #6 coming into the Dance. Remember, seeding is a general reflection of a team’s season resume, and the standard profile of a #6 seed is something in the neighborhood of a 25-9 team that finished third or fourth in the Big Ten — a solid above-average major conference team but nothing special. In six of those nine years, the Spartans overplayed their seed expectation by a total of ten wins, which essentially means that if Izzo’s team was expected by seed to make the Sweet Sixteen, he usually took them to the Final Four instead (in two other years, MSU performed exactly to its seed, and only in 2006 did the Spartans perform below its seed). So what’s happening here? Is this a situation where the “real” Michigan State is the one that sleepwalks through much of the season, vulnerable to several head-scratching games a year despite a surfeit of talent on the floor? Or is the actual team the one that shows up seemingly every March and plows through NCAA Tournament opponents as if they were #16 seeds with multi-directional names? 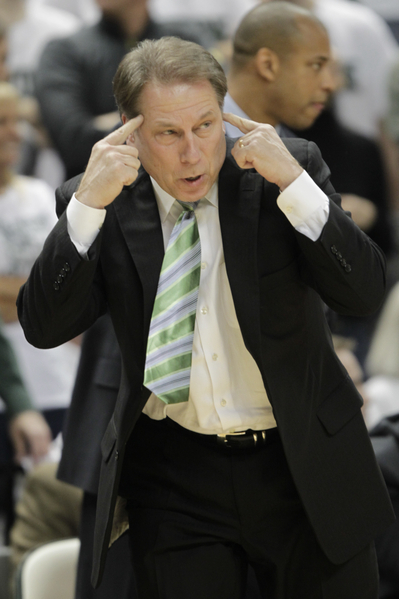 We’ve seen this Izzo dog-and-pony show long enough to have become fully convinced that it’s the former. He recruits numerous good but not great players (only two first-rounders since 2002) who buy into his system and win a lot of games, but nobody will ever confuse Kalin Lucas with John Wall or Durrell Summers with Evan Turner — and yet, those MSU players have been to Final Fours while the others have not. It comes down to this. 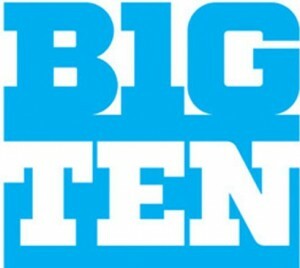 We believe that Izzo is such a fantastic motivator and game coach that when the NCAA Tournament arrives, he elevates his players to the point where a #6 seed from a talent/resume perspective starts playing like a #1 or #2 seed, and before you know it, Sparty is again booking tickets at the Final Four. That collective disgust you heard tonight was the college basketball community once again throwing its hands up in the air as MSU looked slow, tired and generally unathletic against the much more aggressive and high-flying Longhorns. The Spartan goals sphinctered up to the point where they shot only 29% for the game and 19% from deep while committing six more turnovers than the younger ‘Horns, including several from Korie Lucious that nearly made Jay Bilas get up out of his analyst’s chair and deliver a tirade at the Final Four point guard himself. And as for that legendary Michigan State defense? Well, it guarded the foul line well (11-21) and not much else tonight, as UT’s big four of Jordan Hamilton, Gary Johnson, Tristan Thompson and Cory Joseph went for 59 points on an array of dribble-drives and ensuing layups/dunks that often made the Spartans look cemented into the hardwood. To a casual observer of this game, it would be extremely difficult to explain to that person why Michigan State is still the better bet in March, but riddle us this: will anyone out there go on record to say that the Spartans definitely will not make it to Houston in April? 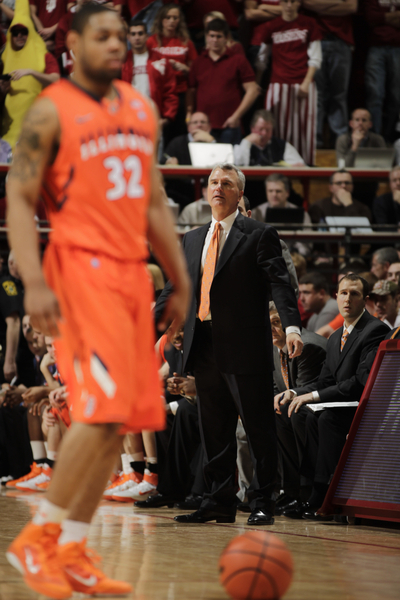 Or that Rick Barnes’ Longhorns will? Yeah, didn’t think so — to do so would be to deny what we know to be true, that Izzo will figure out a way to make the magic happen again.